DALLAS, Texas – The crowd estimates for the Monterey Pop Festival in 1967 exceeded 200,000, as people came from all over the country to see and hear Jimi Hendrix, The Who, Janis Joplin and the Grateful Dead. Additionally, they were also treated, many for the first time to Hall of Fame soul singer Otis Redding. It was a historic event when you look at the scale of the show, the names on the bill and the fact that it highlighted the Summer of Love at its apex. The set list for Hendrix is littered with covers and hits that have stood the test of time. Hendrix opened with Killing Floor a Howlin’ Wolf Cover, then led into Foxy Lady followed by a Bob Dylan cover of Like a Rolling Stone and B.B. Kings’ Rock Me Baby. The back half of the set list was highlighted by The Leaves’ Hey Joe, Can You See Me, The Wind Cries Mary and possibly is most famous song Purple Haze. Every one of these songs at this iconic event was played on Hendrix’s iconic Salt and Pepper Black Fender Stratocaster (shown in photo). This Stratocaster guitar, an undisputed piece of music history, is expected to sell for $750,000 in Heritage Auction’s special 50th anniversary Summer of Love celebration June 17th-18th in Beverly Hills, California. Fresh off U.S. exhibitions as well as London’s Victoria & Albert Museum, the guitar makes its auction debut at Heritage following rigorous authenticity analysis. The Experience Music Project curators conducted a thorough survey of the instrument before it went on show in Seattle and Fender’s own experts have also forensically examined the guitar. The guitar is being offered by a private collector from the U.K. The guitar was swapped at the last minute before playing Wild Thing and then famously being set on fire. His performance at the Monterey Pop Festival is considered by many to be one of the defining musical performances of the 20thCentury. “This is also the guitar he played at all of Bill Graham’s San Francisco Fillmore West on that short tour,” Shrum said. “And back in the United Kingdom the week before he was playing this guitar when he opened his Sunday show at the Saville theater.” The guitar opens with a $500,000 bid. The Salt and Pepper Black Fender Stratocaster retains Hendrix’s upside-down and back-to-front stringing that subtly changed the voice of the new ‘reversed’ bridge pickup. 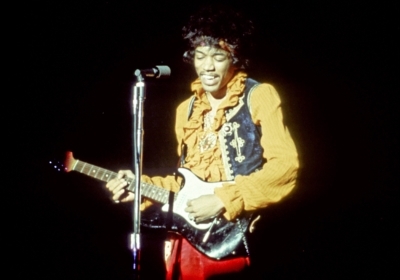 Perfectly preserved is Hendrix’s belt wear on the guitar’s back, visible on footage taken at the Monterey Pop Festival. Hendrix went on to use this instrument on many additional dates, expanding the area of wear. After the Monterey Pop Festival appearance, Hendrix played this black Stratocaster at shows at the Fillmore West and at Golden Gate Park in San Francisco. Heritage Auctions is the largest fine art and collectibles auction house founded in the United States, and the world’s largest collectibles auctioneer. Heritage maintains offices in New York, Dallas, Beverly Hills, San Francisco, Chicago, Palm Beach, Paris, Geneva, Amsterdam and Hong Kong. Porl was part of the original lineup of the Cure, and was in and out of the band until 1994 when he left The Cure to play with Jimmy Page and Robert Plant of Led Zeppelin during the Page and Plant tour of 1995. Porl is also a talented artist website; Porl and designer Andy Vella are the co-founders of Parched Art, which has produced many of the record sleeves found on The Cure albums, many of which Porl drew or painted. Porl has also held his own artwork exhibition “100% Sky”. Porl officially rejoined the band for a third time in June 2005 and recorded the live DVD, The Cure: Festival 2005 and appeared on their 13th studio album,“4:13 Dream”.He also toured with The Cure for their 2007-2008 4Tour.